For the next 12 days, I'll hold a daily giveaway. And here's a picture of all the stuff that will be leaving my studio and headed out to you! How's that for a big old pile of goodness! For those of you with keen eyes, you'll spy: Modern Whimsy, Tufted Tweets, Urban Circus, Pooches and Pickups, Nesting Chairs and Olive the Ostrich holiday pillow panels. Every morning I'll draw a winner from the previous day and post a picture of the next bundle of fabric that's up for grabs. So put a note on your calendar and remember to come back every day for the next 12 days and leave me a comment and you could end up with yummy some fabric treats. Tell your friends and spread the cheer. The more the merrier! Here's the goodies for today's giveaway! Just leave a comment here in order to be registered to win. Make sure you I have a way to contact you. So take a quick pause in your reading right now, and leave comment on this post in order to be signed up to win the Day 1 giveaway. Good luck everyone. And see you tomorrow for the announcement of the Day 1 winner and for the start of the Day 2 giveaway!! 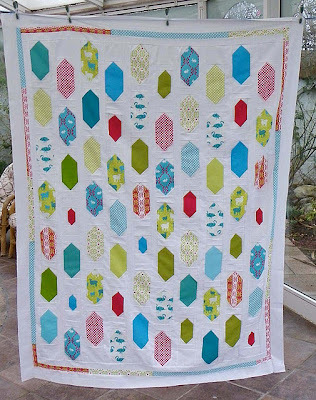 What a beautiful quilt- I love all your fabrics! What a fun giveaway series! 12 drummers drumming would be fabulous - I'd turn them into a drum corp - love them! Seriously, I'm posting only the third comment? Great giveaway. I'd pay the 12 drummers to cease-and-desist! 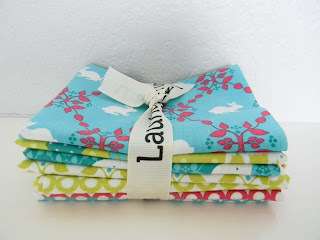 Would love to win one of your giveaways - love your fabric!!! Noise-cancelling earphones and if that doesn't work, I could well become the thirteenth. Mad about your design style it hits the right note! Oooh, fun giveaway. Twelve drummers drumming? I'd ask them to put away their drums and help me clean my house - what I couldn't do with 12 extra pairs of hands right about now! If I had 12 drummers drumming, I'd have to find some ear plugs! For me, I hope within the twelve days I get to receive both my orders from (Black Friday & Cyber Monday) Fat Quarter Shop. Let's hope the postal service is good for me to send it halfway around the world. Is it greedy to enter this giveaway when you already kindly gave me this bundle? Yes? Well, you'll need those 12 drummers to drag me away from a prize this good! I agree about the ear plugs. I think I would take them down to the local football field and let them make a ton of noise. Wow! Visions of quilts keep circling in my head! These packets are awesome! What a sweet giveaway! :) I'd take them to visit my sweet neighbor Karen, who is currently in a nursing home. They'd love that! 12 drummers drumming? I think I'd listen to two or three songs, and then I'm afraid I'd have to show them the door. Someone else mentioned my very first idea: take away their drums and set them to cleaning my house. If they felt the need to beat on things, though, they could put up dry wall in my basement. Love the fabric, I am a huge fan of yours. I would use 12 drummers drumming to get my husband out of bed, it is next to impossible to get him up in the morning! I'd join in so there would be 13 drummers drumming! that might spoil the song though so I would have to get rid of one and take his place! Wow how superbly generous you are! 12 drummers drumming? I think I'd send them on their way pretty quick I think! Failing that they could give my children a drumming lesson or two! with 12 drummers drumming I'd get them to march down the street and see if we could start a flash mob in quiet, sleepy Yorba linda, CA. Thanks for a chance to win. Love your fabric. love your fabrics! thanks for the giveaway! Oh, what a great giveaway! Thanks!!! I would station the twelve drummers on my front porch and they would play every time visitors arrived during the holiday season. such pretty fabrics! 12 drummers drumming? i'd add them to my boyfriend (also a drummer), to make a lucky number 13! oh what a great treat ... 12 drummers drumming, to compete with my neighbors stereo. Thanks for the great giveaway. I am a new follower and with 12 drummers drumming, I would ask them to drum to the beat of what a great giveaway this is. Thank you so much for a chnace to win. You are so generous, are you sure it's not the plague drugs speaking!! I think I'd like the 12 drummers to take my 3 kiddies off to make noise elsewhere, so I could sew in peace! I would ask the 12 Drummers to lead the parade for our high school football time- Super Bowl Champs! And then make a twirl skirt for DgD out of the sweet fabric! I would bring them all to Kindergarten with me! What a fun giveaway. I love the colors of those fabrics. I totally agree with Flying Blind. Take my kiddos and make all the noise you want (somewhere else) so I can have an hour to sew in peace. I work nights, so when the young fellow next door has his band over to his house to practice I don't get any sleep, I think I would gladly drop the drummers on his stoop at around 3a.m. Such gorgeous stack for fabrics! Thank you for all the giveaways in the next 12 days! The 12 drummers drumming could go across the street to the middle school and play with the kids instead, ha! pick me! :) I would take away all their drumsticks! I am in need of quiet time. When I was in college I used to yell at the hippies outside at night having drum circles outside my dorm room... lol maybe I'm just a scrooge? As for 12 drummers drumming...that may be just enough drummers to march my 3 kids to bed!! What an exciting 12 days coming up! As for the drummers......hmmmmmm. Have them over to play and march around the tree on Christmas morning? Thanks for the generous giveaway, Laurie! What a fun idea :) I'd march those 12 drummers all around our neighborhood... not sure I'd be very popular after that, but hey - it's the holidays!!! Hi Laurie! I'm not really entering, but think this is so cool that you are doing all of this. The fabric is awesome! I'd make some spiked hot cocoa for us all and let them do their thing. Great looking fabric. Let the drummers play...the grandkids would love to hear them! That is a wonderful stack of fabrics you are giving away. 12 drummers drumming - We would have a party and invite my grandson over. He is 9 months old and he would get a kick out of watching them play. As long as they were marching at the same time as drumming I'd join right in! I love a good marching/show band and we just don't have enough of them up here in Canada. Thanks for sharing your wonderful fabric with us and feel better soon! 12 drummers drumming sound great, as long as it's before bedtime! !2 drummers drumming, I'd give them a football to play with. I'd tell the drummers to shush. well, i know for a fact the noise four kids can make on pots and pans - so i imagine i'd be hollering "knock it off!" unless, of course, they were part of an excellent orchestra. I spy Tufted Tweet purple - my favorites of your designs. It's really hard to get modern purple fabrics and when I first seen Tufted Tweets in purple I was in heaven (it's funny, because last evening I was thinking of buying more somewhere:). 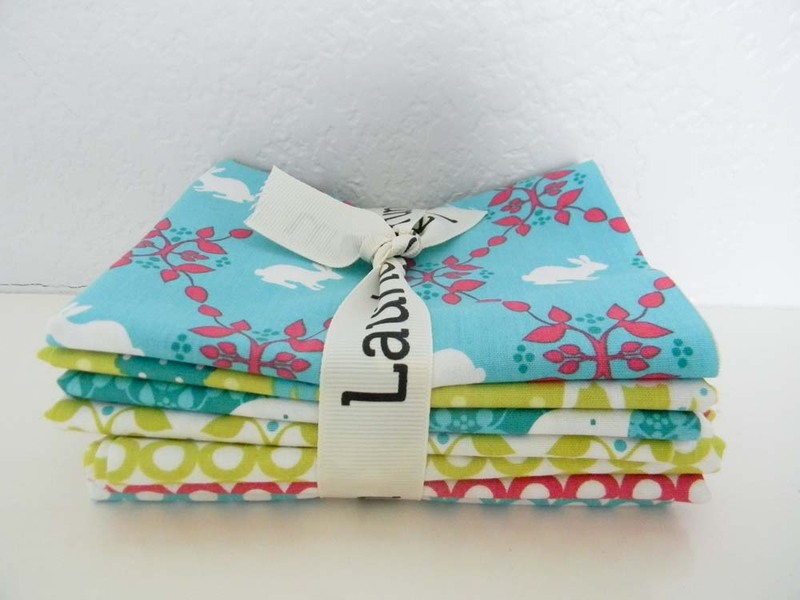 I'm in love with the lamb-patterned fabrics. Thanks for doing this give-away! What a wonderful giveaway! Such pretty fabrics. I would have them go around my neighborhood and make everyone follow! Thanks for the giveaway! I'm really needing fabric to finish my quilt! 12 drummers drumming would be most welcome, they could join with my chidren who play cornets! Great giveaway! I'd love to have the drummers on speed dial just to send as a wake up call to anyone that "needed" it. Great fabric - I would tell the drummers to go eat some goodies - maybe some Christmas cookies. the twelve drummers drumming would feel right at home with the two boys at my house who are constantly banging on things :). They'd have a ball. What a fun giveaway. Thanks Laurie. Cool! I'd have my son enjoy the drummers - he loves musical performances! Twelve drummers drumming would be remodeling my basement! I would make a band and dance all day!! I would put them straight to work cleaning my house (and probably making dinner too). Can you tell I have messy kids (and a messy husband)? Thanks for the chance to win! stephydinger at yahoo dot com. Thanks for such a fun giveaway. I could definitely use 12 drummers to drown out my noisy neighbors! I would totally send the 12 drummers to school and have them teach my music classes all day so I could stay home and sew!!! Awesome giveaway. I'd pay the drummers to follow hubby around all day and annoy the heck out of him. It'd be funny. Where have you been all my 8 months of quilting life??? I decided 8 months ago that I would try to make a quilt, and the rest of the story is exactly what you can guess - I'm addicted! I've made 5 quilts so far, and continue to love it more than anything I've ever attempted. The fabric - oh, the fabric! I love it so much, and today I was led to your site from a FB post. I've already ordered about $100 worth, and I love what you do!!! You're very inspiring to me, and I would LOVE to win some of your beautiful fabric. So, here's my comment - I'm keeping my busy little fingers crossed!!! I would use the 12 drummers drumming to enteratin my two kids while I sew! Great giveaway. I have no idea what to do with 12 drummers, I think it's lucky that it's never been a problem. Always loved a good drumline - having 12 drummers in a room might be a bit much, but I'm sure they'd help me pick up the pace while sewing. 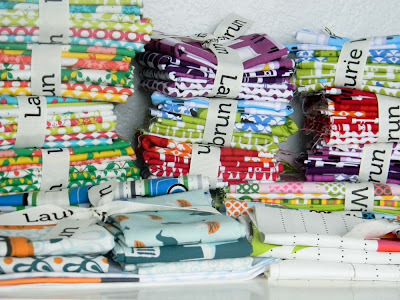 I've been wanting to try my first quilt ... which would be delightful in these fabrics! I'd find some earplugs for me while my drummers do their thing! NOISY!!! Thank you for the giveaway! Twelve drummers? Well they would certainly rock the house(and the neighborhood). But would make the best of it and dance along. Thanks for the giveaway! I love modern whimsy, it is adorable! With my 12 drummers drumming I think I would use them to keep my daughter occupied while I prepare the house for Christmas! (She's 19 months old and loves music!). Pretty sure 12 drummers would be the highlight for my music lovin' 3 year old! Id send the 12 drummers to the kids hospital I work at. Cute giveaway!! First of all, I'm SO excited for Modern Whimsy to hit the stores. I love to support my LQS, so I'm really hoping at least one of them picked it up. I would love to win these. And the drummers? It would end up as 13 drummers drumming as my baby boy would be bound to join in - one of his favourite games is banging things! I can't wait to see your new line IRL. The colors are yummy. What about 12 steel drummers drumming? I'm imagining an impromptu parade down my snow-covered street. That would be awesome. Thanks for the giveaway. If I had 12 drummers drumming I would ask me to drum up and down the village so we could all enjoy their music! i love these modern whimsy circles! love working iwth your colors! and 12 drummers drumming? I'd like them to drum their little tushies off in the house above my flat, where two small children continuously in throws of tantrums or thumping ... at all hours ... they only have a xylophone and a snare drum ... but it sounds like a gazillion of em !! i'd grad a tambourine and join the drummers! thanks for the chance to win! Such a gorgeous quilt - beautiful fabrics!!! 12 drummer drumming sure would make alot of noise. Hmmm 12 drummers drumming? Could be a bit of fun with a beat happening! 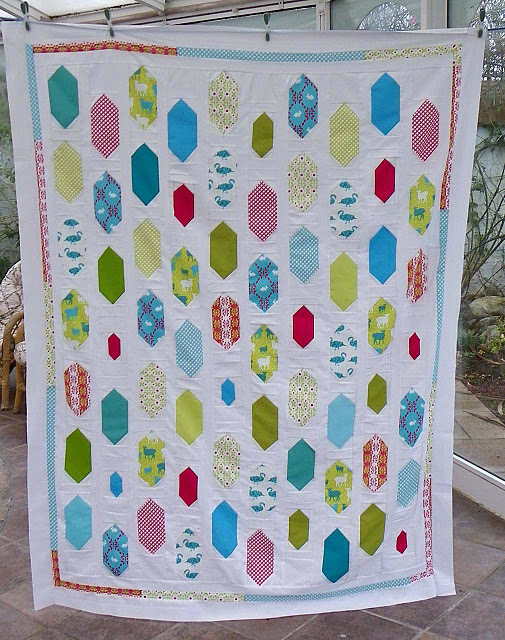 Thanks for today's lovely giveaway - I'd love to be able to make something even half as nice as Allison's beautiful quilt. I'd ask for a lesson - movies like "Drumline" get me thinking that I should have a bit more of a beat in my life! Thank you for the lovely giveaway. The twelve drummers would have to let me beat on their 12 drums too! What fun that would be. Then, would turn them over to my 5 little grandnieces. Wow, 12 drummers would become 17! Thanks for the great 12 day give away. I sewed a cute sack today as a secret Santa gift. I'd have those drummers doing the first number at our elementary students Holiday North Pole Musical this coming FRiday 7 PM sharp! Fabulous giveaway!!! If the drummers were cute I'd say take off their shirts. Otherwise I'd send them over to annoy some people I didn't like, lol. Loving everyone's answers so far. Mmm 12 drummers drumming. I would go to the movies, I bet they would make entertaining babysitters!!!!! Send the drummers to my church to join the praise team for a concert! Thanks for the chance! 12 drummers would be fabulous entertainment for my two young boys! I am a bunny who would flip for a bit of your bunny print. As for the drummers, I would start a neighborhood holiday party. Thank you for the giveaway. Oooo fantastic giveaways! I love drumlines so I would get them to form a circle and go for it! After that they could help me finsh my decorating! Have them give my kids drumming lessons!! What a great giveaway. I'd send the Drummers on a tour of the neighbourhood to spread the cheer. Hope you feel better soon. 12 drummers drumming?! Throw them in a room with my equally loud 2 year old! :) Great giveaway! What would I do with 12 drummers drumming? Well, I live on a military base, so I'm sure we could find something for them to do! They could drum the soldiers out of bed, or to the mess hall. 12 Drummers drumming would certainly cancel out any other noise around here. I bet they would be really good at entertaining three little ones so I can get some sewing done. I'd send them to my neighbours so they can create a bigger racket with the kids there! 12 drummers drumming? Easy. They'd hang out at my desk at work and they'd start a rum-pum-pum-pumming every time someone started complaining about anything. Just cut 'em right off with some holiday cheer, ha! I would rent them out. If you calculate it out paying by the hour, every 24 hours I could make $2,500. 12 drummers drumming . . . hmmmmm. I think I would kick them out . . . a lot of noise gives me a headache ;) Thanks for the generous giveaways!!! If I had 12 drummers drumming we'd have to have a Christmas Parade! I'd send those drummers down our town main street for a nice festive drumming parade! What a fantastic giveaway - I have a 2 year old that likes drumming with the saucepans, not sure I could cope with 12 of them! I could use the 12 drummers to get the teenager out of bed in the morning. He sleeps in a sleepout and I can hear his alarm from the house, but somehow he can't! The 12 Drummers would be useful to plant in front of my neighbour's home to drown out the noise of the new trumpet player. Wow, what a great giveaway! Hmm, 12 drummers drumming. What to do, what to do! I'd send them down to the pier in our little town and have them play and pass the hat to earn enough money to buy Christmas gifts for all the kids here that might not have a Christmas otherwise. I could use the 12 drummers to wake me up in the morning! I am so tired these days because it is the busy season and I am in the midst of writing school reports for my students! It could be cool to have 12 drummers doing the drumroll when I pull something delicious out of the oven. And if I filmed that I'm pretty sure that would be an instant YouTube hit. I'd probably cope with the 12 drummers, but I don't know what I'd do when the 11 pipers piping turn up! great giveaway - thanks! What else could I do but rock on! Embrace the drummers! 12 drummers would nicely line up along my driveway! Great giveaway! And I woke up fretting over what to get my neice's husband - who is a VMI grad - and you solved my problem with 12 drummers drumming - he'd love it! Thanks. take them shopping to clear the way. Oh how fun ! Nice giveaway. What a fun place to stop by. How fun! With 12 drummers drumming, we'd have a dance party!! 12 drummers, don't have a clue what to do with that. Now the fabric, I do know what to do with that.